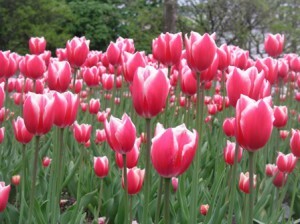 Tulips of all colors capture the spirit of May! Long evenings allow fuller days: We simply seem to get more done, personally and professionally. The days in May are as long as those in late July and early August, which most people do not realize. More sun in our lives: As the wet weather of April gives way to sunnier days in May, we feed off the energy of all that sunshine! We have ways to stay energized in the shorter days of late Fall, Winter and early Spring, but the copious natural energy that starts in May makes it so much easier to get early starts and keep moving well into the evening. Feeding off other’s energy, which we all should do every day as a matter of course: This gets easier when everyone is full of their own Spring-inspired energy! How should you capitalize on this high-energy month? Move meals (and meetings?) outside before the Summer season officially kicks off around June 1. Why wait for everyone else? It might still be a bit cool, but you can bundle up against any lingering Spring chill. Take evening walks with friends or family to fully enjoy later sunsets, instead of just peeking at them through the window. This is a great way to wind down after a busy day, and gets you out in the fresh air if you have been in an office all day. May is truly a time to grasp a full measure of the energy nature has to offer. Don’t waste a minute of it! What do you think? Has May always been a time of personal productivity for you? Let us know if you are as big a fan of May as we are! HubSpot and Netflix Offer Insights on Building Productive Organizational Cultures Are Millennials Really Different About Job-Hopping?